Automate sending LiveChat chats and tickets to your Helpmonks inbox or email address. Take advantage of both tools and keep your communication with customers in one place. Helpmonks is the email management platform that lets your teams comfortably cooperate on email conversations. With this solution, you can easily organize your emails by labeling them or assigning to specific teams. Collaborate with your team on leads: add notes and contacts. Helpmonks will give you a summary of every conversation with a customer and help you get a full picture of your clients. What’s more, you can store user data and trigger an email when the user interacts with your service. Keep your users engaged with your service by sending them useful information or tips after a certain action. With LiveChat for Helpmonks you can make sure that all of your communication will be kept in one place. Whether thinking about chats or tickets, make sure that you will keep everything neatly organized. LiveChat will automatically send your chats to Helpmonks inbox. Whenver your customers will leave you their emails, you will be able to reach out to them straight from your inbox! Use this opportunity and make sure that no customer will stay unattended. With LiveChat comes tons of customer data — the pre-chat survey collects contact details, chat transcripts give powerful sales insights, and post-chat survey can be used to gather feedback. You can use it all of these to communicate after a chat with Helpmonks. The wide range of chat tools provided by LiveChat allows serving clients much faster. React to problems when they occur and delight customers with effective assistance, boosting satisfaction rates at the same time. LiveChat makes it possible for you to engage customers in a real conversation. By sending personalized invitations, you can act as a real shop assistant who offers help and guidance. Use your charm and help customers become your happy clients. 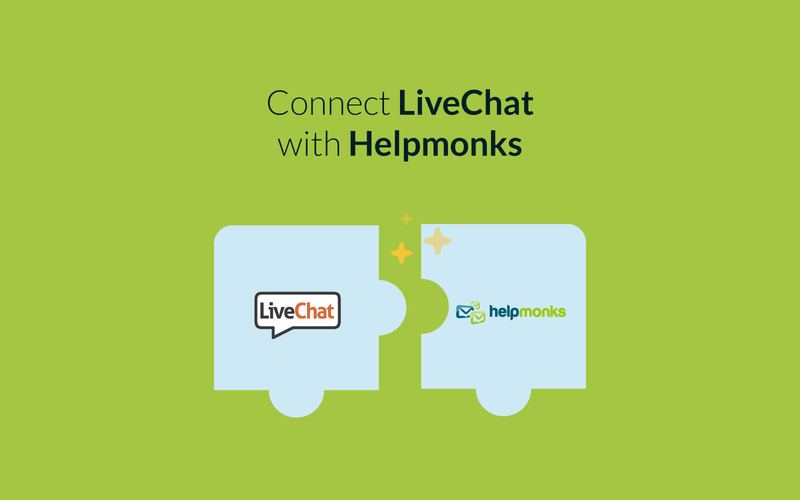 Start using LiveChat with Helpmonks now!